My only complaint with this second volume is that it’s simply too short. I want each and every instalment in this series to consist of at least 600 pages! Is that too much to ask? I love the languages. Are they speaking actual Esperanto on Wreath? Doesn’t matter. I love that it was so easy to get the meaning even though it was so different from English. So, when’s the next one coming out? And can it please be longer? At least three times the length of this Volume? 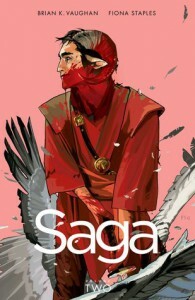 I spent a thoroughly enjoyable time with Saga 2 and I want MOAR, pretty please.